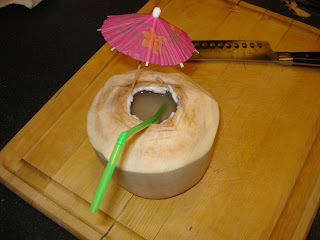 Fresh young coconut is my favorite drink in the world : ) Up until now, I had to beg my husband to open them for me. 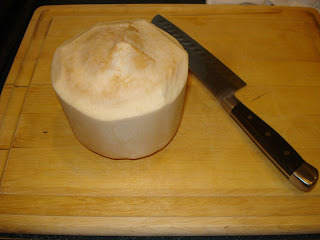 This would involve Max bringing out a large knife or hatchet and whacking at the coconut violently (and me feeling guilty for asking him to do it and praying that he would still have all of his fingers at the end). 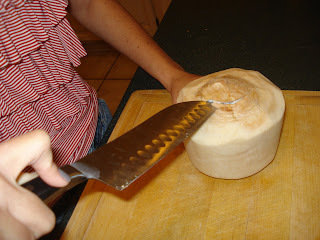 I finally searched online for a how-to article and was promised an "easy way" to open a coconut - no brute strength required. Much to my surprise, the article had told the truth! 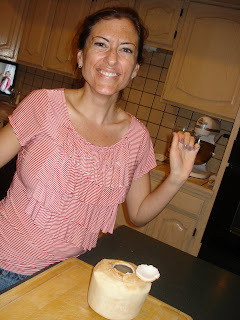 I am now a coconut opening machine!! I thought I'd share the simple steps so the next time you're at the store and see fresh young coconut for sale you won't hesitate to buy one! Step Three: Pry the knife in the indent and a "door" will appear and lift up! 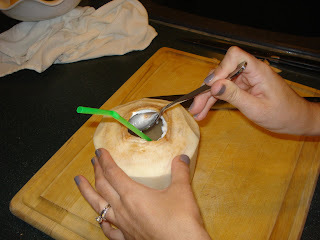 And one more tip we learned from our favorite waiter at our Thai restaurant in California: when removing the flesh of the coconut, use the back of your spoon to pry it off. An instant snack! Yum!